Prime Time Sports Talk | How will Bruins Cope with Injuries? How will Bruins Cope with Injuries? It’s that time of the year again. The playoffs are there and half of the Boston Bruins’ roster is on the injury shelf. In all of the recent playoff runs, the Bruins ended up haunted by the injury bug. It happens to all the teams and everyone has to find the way, but the B’s might be without seven players headed to Game 3 in Toronto tonight. That’s completely different than how the Bruins expected when they were nearing the playoffs’ start. 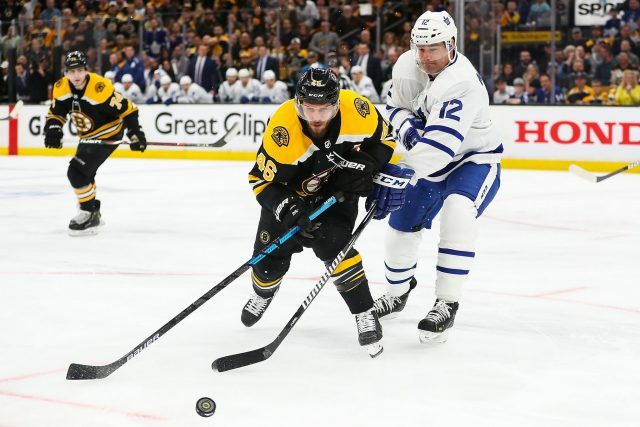 In Game 2 on Saturday, the Bruins played a physical style of hockey which propelled them to a convincing 4-1 victory over the Maple Leafs. But the Bruins seemed to pay their own price for all of that physicality they have shown in the contest. Jake DeBrusk’s contact and confrontations with Nazem Kadri were fun to watch as the young winger tried to respond on veteran center’s hit on him in Game 1. It might’ve cost Kadri a suspension, but Debrusk has ended up banged up. He already experienced a concussion this season and had to miss nearly 10 games because of it. After being doubtful following Game 1, he was even more in doubt after Game 2, but it seems like he will be in for Game 3. And the most important thing is not whether he plays, but whether he is at 100%. Debrusk has played a ton of games this season and hasn’t looked sharp. The Bruins need Debrusk to be fully healthy and firing on all cylinders up in Toronto. Then there is Marcus Johansson, who didn’t suit up for Game 2 because of an illness and will miss Game 3 as well. Throw Sean Kuraly in as well. That’s three important offensive players missing or banged up for the Bruins. Along the blue line, the Bruins probably won’t have Kevan Miller for the rest of the playoffs, while John Moore is still recovering from his upper-body injury suffered exactly three weeks ago in a game in Tampa Bay. Torey Krug left the game on Saturday and it didn’t look good, but he appears to be ready for Game 3. Connor Clifton also left the game with an upper-body injury and is listed as day-to-day and out for Game 3. The Bruins are short on options. With all those injured defensemen prior to Game 3, Steven Kampfer and will slide into the lineup. Injuries never come at a “good time,” but these defensive absences are really inconvenient. Urho Vaakanainen managed to play just one game out of three during the weekend’s schedule in Providence while Jeremy Lauzon is out with an injury. Those two would probably dress over Jakub Zboril, who is with the Bruins as an emergency call-up. Game 3 is going to be important. The Maple Leafs now hold a home-ice advantage and Boston must win on the road, maybe not just once. There is still a good possibility that the Bruins might get Moore back soon, but perhaps not for Game 3. Those two games in Toronto are going to be crucial and the Bruins have to play their best hockey, mainly defensively. Just remember last year, when the B’s struggled to get at least one win out from the Scotiabank Arena. This time around, it will be extremely tough as well. On the other side, we can see how the Columbus Blue Jackets go through the injuries on their back-end. The Bruins just need to play solidly as a five-man unit. If this is going to be a deep playoff run for Boston, they will have to show a big character in those next two games in Toronto. The main goal is not to come back to Boston down 3-1 heading into Game 5 on Friday.